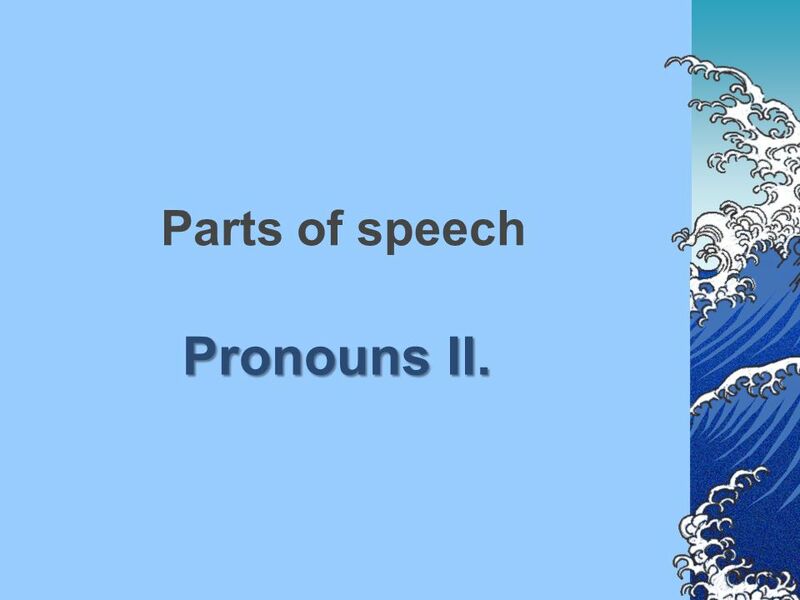 2 Parts of speech Pronouns II. 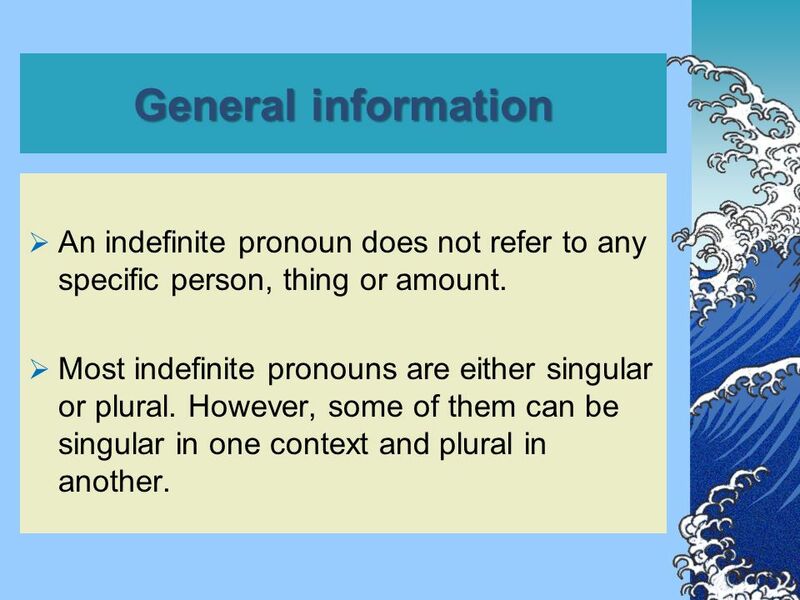 3 General information  An indefinite pronoun does not refer to any specific person, thing or amount. 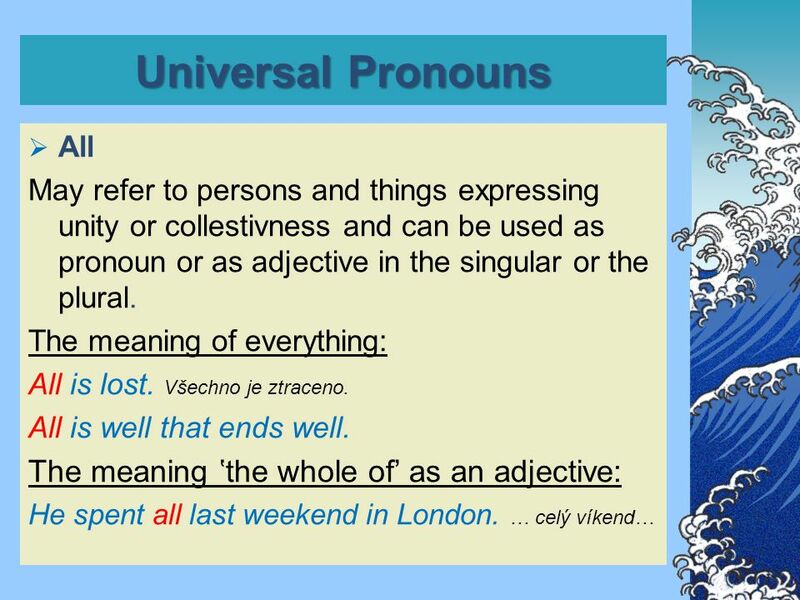  Most indefinite pronouns are either singular or plural. However, some of them can be singular in one context and plural in another. 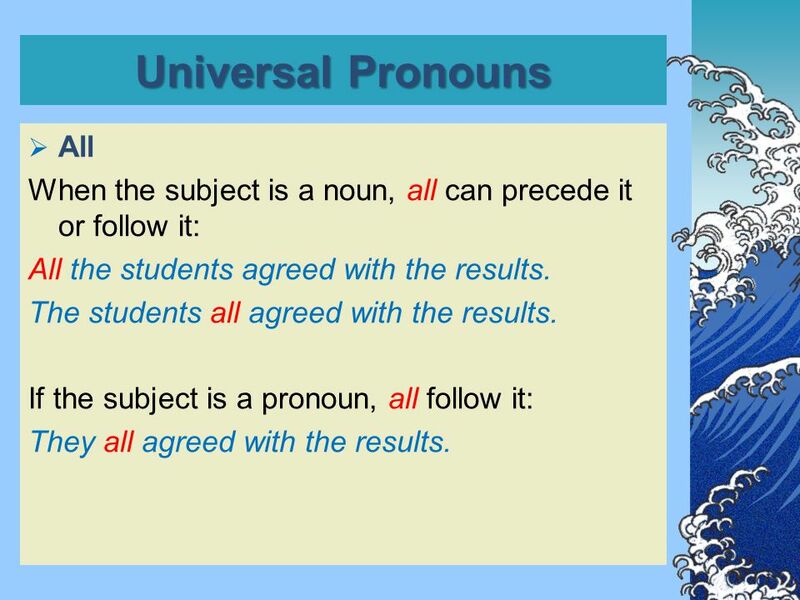 5 Universal Pronouns  All When the subject is a noun, all can precede it or follow it: All the students agreed with the results. The students all agreed with the results. If the subject is a pronoun, all follow it: They all agreed with the results. 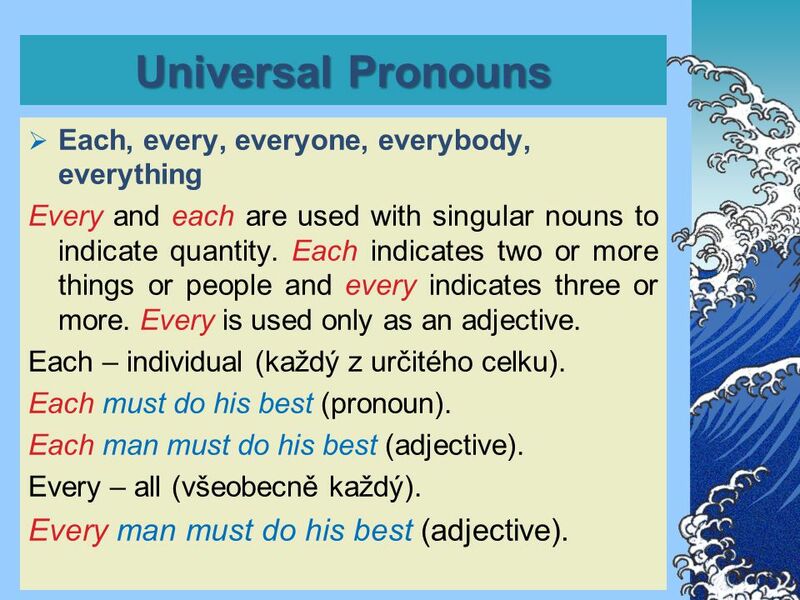 7 Universal Pronouns  Each, every, everyone, everybody, everything Every and each are used with singular nouns to indicate quantity. Each indicates two or more things or people and every indicates three or more. Every is used only as an adjective. 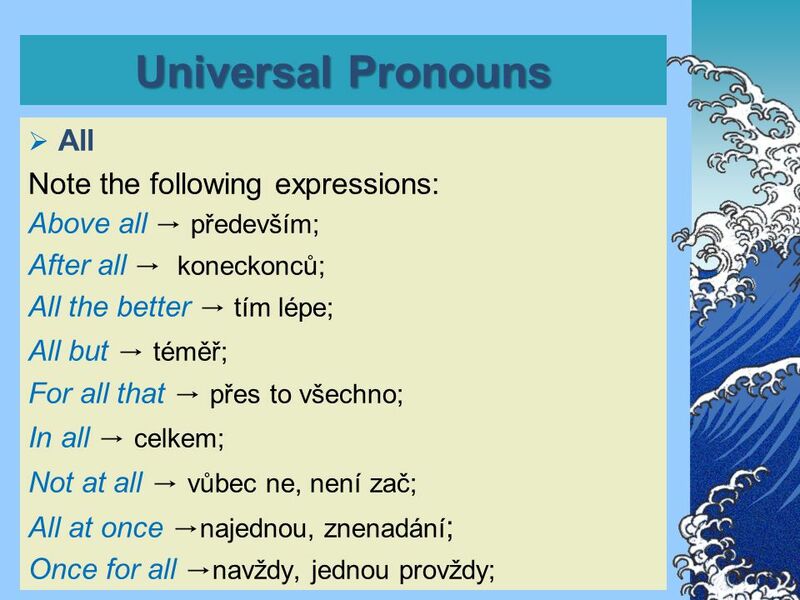 Each – individual (každý z určitého celku). Each must do his best (pronoun). Each man must do his best (adjective). Every – all (všeobecně každý). Every man must do his best (adjective). 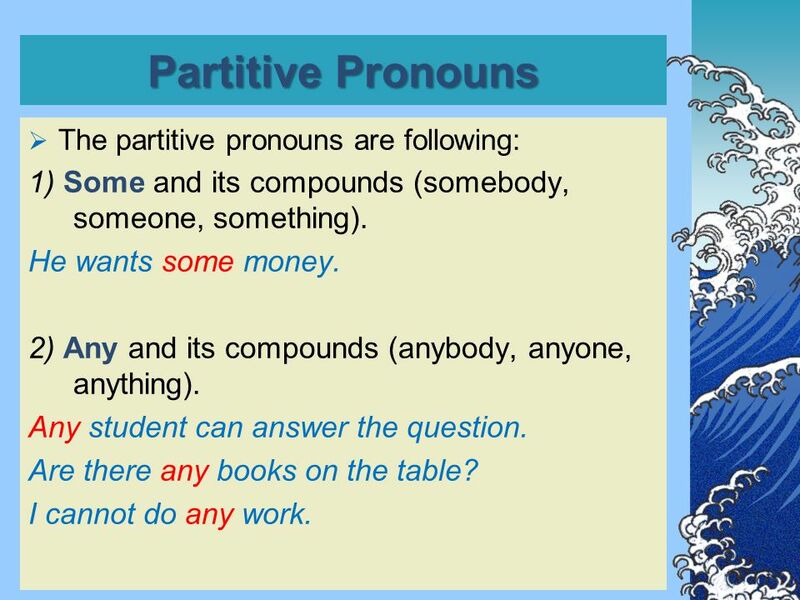 8 Partitive Pronouns  The partitive pronouns are following: 1) Some and its compounds (somebody, someone, something). He wants some money. 2) Any and its compounds (anybody, anyone, anything). Any student can answer the question. Are there any books on the table? I cannot do any work. 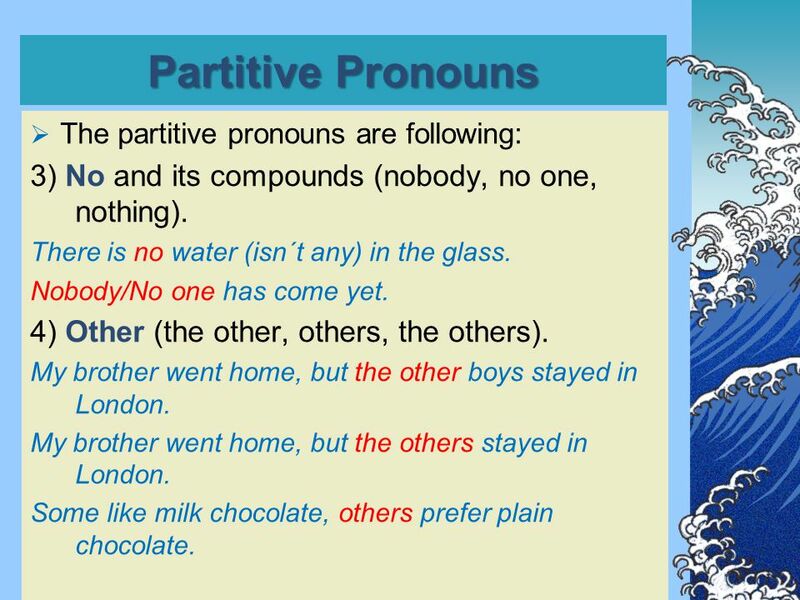 9 Partitive Pronouns  The partitive pronouns are following: 3) No and its compounds (nobody, no one, nothing). There is no water (isn´t any) in the glass. Nobody/No one has come yet. 4) Other (the other, others, the others). My brother went home, but the other boys stayed in London. My brother went home, but the others stayed in London. Some like milk chocolate, others prefer plain chocolate. 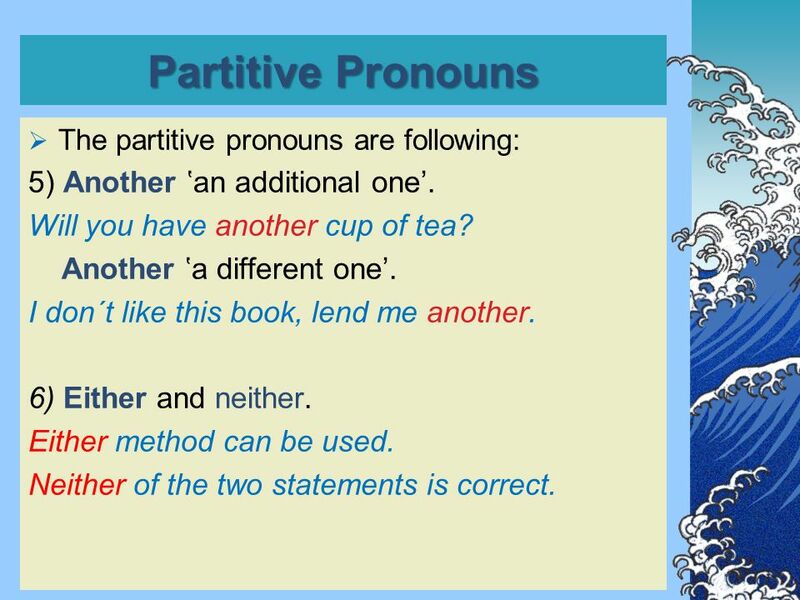 10 Partitive Pronouns  The partitive pronouns are following: 5) Another ‛an additional one’. Will you have another cup of tea? Another ‛a different one’. I don´t like this book, lend me another. 6) Either and neither. Either method can be used. Neither of the two statements is correct. 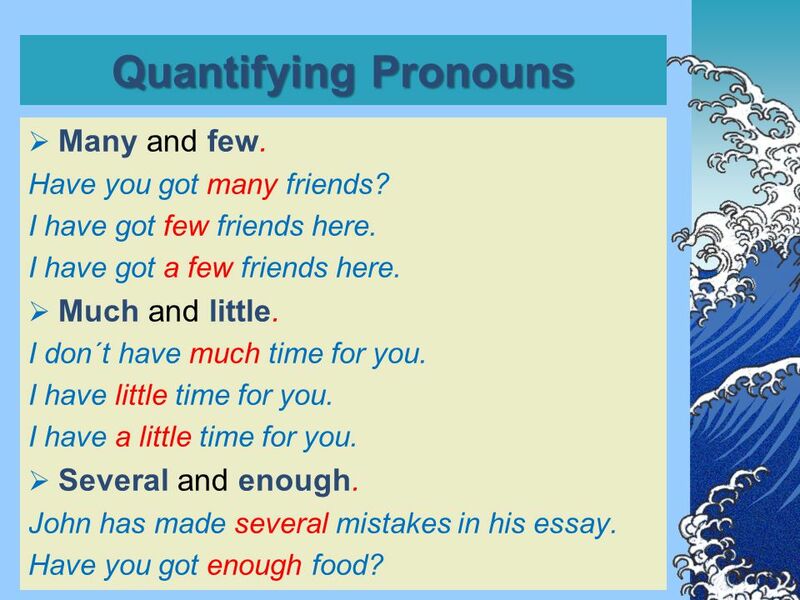 11 Quantifying Pronouns  Many and few. Have you got many friends? I have got few friends here. I have got a few friends here.  Much and little. I don´t have much time for you. I have little time for you. I have a little time for you.  Several and enough. John has made several mistakes in his essay. Have you got enough food? 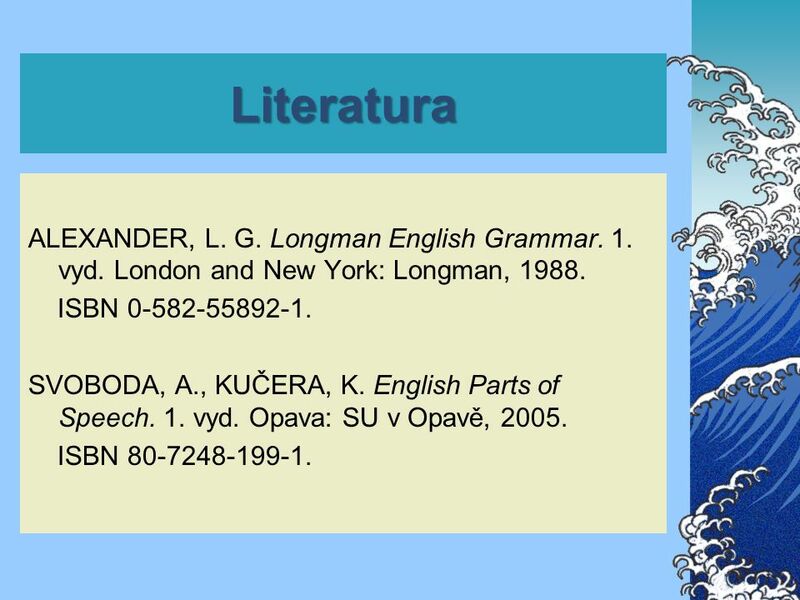 12 Literatura ALEXANDER, L. G. Longman English Grammar. 1. vyd. London and New York: Longman, 1988. ISBN 0-582-55892-1. 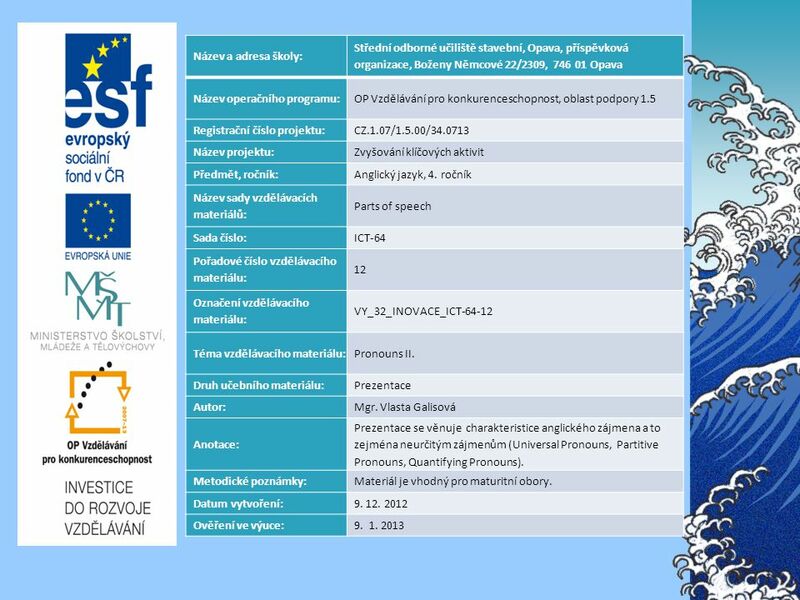 SVOBODA, A., KUČERA, K. English Parts of Speech. 1. vyd. Opava: SU v Opavě, 2005. ISBN 80-7248-199-1. 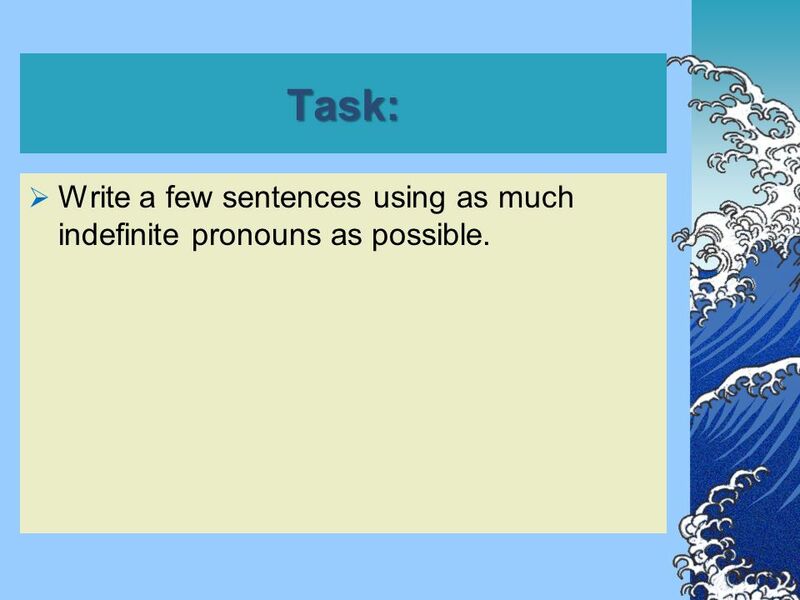 13 Task:  Write a few sentences using as much indefinite pronouns as possible. Stáhnout ppt "Název a adresa školy: Střední odborné učiliště stavební, Opava, příspěvková organizace, Boženy Němcové 22/2309, 746 01 Opava Název operačního programu:OP." Excel 2010 karta Rozložení stránky. Název a adresa školy: Střední odborné učiliště stavební, Opava, příspěvková organizace, Boženy Němcové 22/2309, 746. Windows 7 HLAVNÍ PANEL. Název a adresa školy: Střední odborné učiliště stavební, Opava, příspěvková organizace, Boženy Němcové 22/2309, Opava Název. Název školy: ZŠ štětí, Ostrovní 300 Autor: Lenka Pizúrová Název materiálu: VY_32_INOVACE_AJ.7.A+B.08_countable_and_uncountable_nouns Název: Countable and.